Growing up in Eastlake, Ohio I loved cooking and baking with my Mom. I wore a bright yellow “Cheerios” chef hat, called myself “Katie Cook” and using a wooden spoon as a microphone- pretended I had my own cooking show! 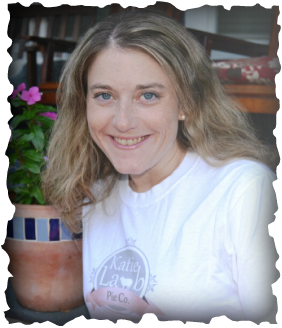 It was a pumpkin pie that started the Katie Lamb Pie Company. The pie was such a hit at my office, a co-worker asked if I would make her family’s Thanksgiving pies. That first year, I made 8 pumpkin pies. Soon, word spread and I was making pies, specialty cakes, cookies, and cupcakes. I am pleased to offer delicious, made-from-scratch desserts, baked at my home in Lakewood, Ohio for all occasions. When I’m not baking, I stay busy working as a Nurse-Midwife, delivering babies at University Hospital Elyria Medical Center. I also enjoy attending a variety of sporting events, especially cheering on the Cleveland teams, and traveling with my husband, Devin.